If you can't bring the artist home, clone the performance! ArtistCloner, cloning audio experiences! The goal is simple; to emulate/clone a recorded performance and have a very good illusion that it is happening in the room naturally. Easier said than done. Time, perseverance, skills and the will to build this type of speaker is paramount to getting a performance of exception. We need to get the best performing drivers with the proper tone to attain our goal. Attention to the details is the name of the game. After 8 years of refinement, edition 6 of this evolution towards the goal is finally here with the REBEL REFERENCE. The intimacy and natural cues reproduced by this speakers are absolutely stunning. 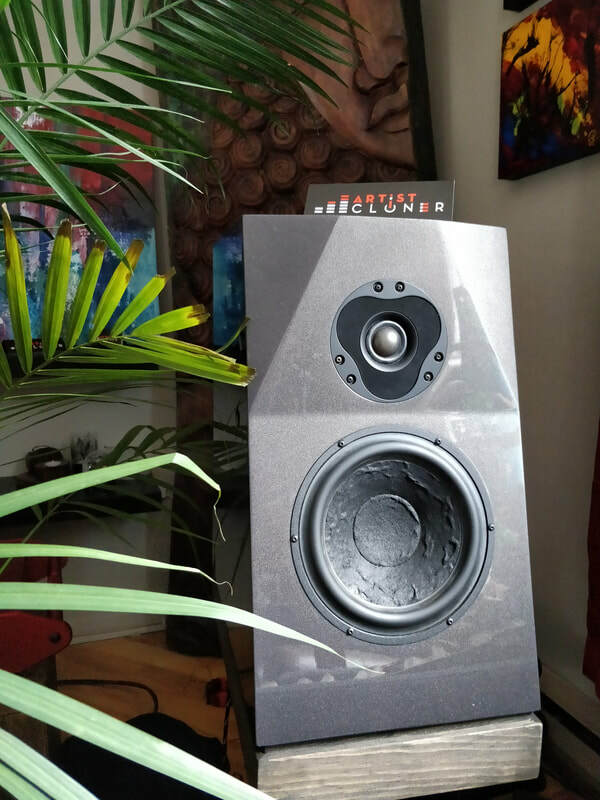 The impression of having the artist in the room is jaw dropping making this speaker a worthy addition to the ArtistCloner family. New as of August 2018, the crossover has been simplified. This gives an even better blend of the drivers with depth and room cues to be envied by many other speaker manufacturers. Sophisticated in its conception and construction. All the angles on the face plate serve a purpose and have been optimized to extract the best performance from the drivers. The material used to build the cabinet is High Density Fiberboard (HDF) of a total thickness of 1 inch (254mm). The thickness is accomplished by glue and high pressure application of two 1/2 inch sheets of HDF. Why go through the trouble and not use a 1 inch HDF board? HDF boards are basically wood dust and glue compressed with a high pressure press. The process leaves the sheet with different densities compared from the surface to the center of the sheet. Near the surface the density is high and gets less dense towards the center and gets denser again towards the other surface. The result is dense, less dense, dense. By using two sheets of HDF to get the same thickness the following results are observed: dense, very dense, dense. Obviously the two sheet design is superior in density and makes a much more solid cabinet that sings less with musical notes than a single sheet design. By using two sheets we also stabilize the HDF from shifting/curbing. The gluing and then high pressure application (72 hours) shifts the two sheets and makes for greater losses in materials thus raising the cost. The different angles on the front face are designed for better dispersion and time alignment of the drivers giving great coherence to the perceived soundstage localization, depth and width. The finish of the cabinet uses top quality products and their application is meticulous. The advantage is the performance of these new cabinets is without reproach and will be used from now on in the fabrication process. The drivers utilized in the speakers are from a highly respected manufacturer that has a very good reputation and has been manufacturing drivers since 1970. Why use mediocre drivers if you want the best? You don't! The drivers are chosen for their properties that make them a great match together when properly crossed over with phase tracking. The drivers in the Rebel Reference have been around for many years and have been used in top sounding speakers around the world. There are many materials to choose from and we have tested many but not all of course. We have to be somewhat conservative on driver composition and use what has been proven. Remember the craze for Kevlar speakers cones? Everybody was singing the praises of a stiff cone that could stop a bullet. Remember? Well when tested they had severe breakups and just sounded awful musically. Where are those speakers today that use Kevlar for cones? No where to be seen but oh the craze for those bullet stopping cones! Just a lesson from the past to not jump the gun too quickly on new supposedly better cone materials. Paper and textile have a proven track record and are still used widely by many manufacturers with good reason. All materials have there drawbacks and choosing the least offensive with natural tone usually comes from something organic. We are not saying that other materials can't or don't sound good just that our choices to this day still bring us back to these organic materials. This doesn't mean we will not use other materials in the future as development and advances in speaker drivers are in constant research which may bring the next generation of musicality with less drawbacks. Technology is nice but what we want is musicality so choose your poison wisely and enjoy. The crossover is probably the hardest to get right if you aim at getting the phase of the system locked in with a great transient response. When this happens the speakers disappear and the sound is particularly natural. We have opted for quasi series crossovers because they can accomplish tasks that would require more components when compared to a parallel crossover which 99% of all speakers have. Series type crossovers tend to provide better tweeter protection at higher volume and better dampening of both drivers. They respect better the nature of sound wave front compared to parallel and blend the drivers in a much superior way than parallel crossovers. They sound more dynamic, live, natural and offer a more resistive load to the amplifier with lowered electrical phase. The added touch of baffle step correction makes for a very musical presentation and still keeps the crossover interference low overall. Inspired by the work of pioneers on the series crossover concept (Mr I. BUD Fried to mention one), the development and tuning of such a crossover is highly rewarding but not inexpensive to acheive as it is time consuming. You change the value of one component and this will probably affect the tuning of the other driver. You can't tune the drivers individually and as such may cause hair loss. :) We also use the best components in our products such as: air coil conductors, military grade resistors and metal film capacitors when used. The crossover is hardwired to preserve the integrity of the signal and silver soldered. Why isn't a series crossover more popular? We don't believe that these are valid reasons to not explore and use such a crossover if the results are superior which they are in this case. A very sturdy and well made binding post that sounds fantastic! 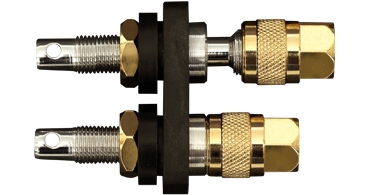 For Europe high quality CE approved connectors are installed. Having built many speaker stands with different approaches some construction details stand out to getting a great stand. The latest stand is a dual tube design that sports many features to obtain high performance sound. These new stands can be filled with steel shot to add weight, rigidity and move resonance frequencies of the structure to less interfering frequency nodes. The difference with a simple knuckle wrap test is very revealing in the resonance control obtained once filled. The effect on the sound is very well worth the effort and expense of filling these tubes. The amount of shear presence, power of communication and drive get upped by a significant margin. Resolution, detail and macro nuances that are part of a live intimate show are present and very addictive. (9 1/2 inches wide X 14 1/2 inches deep) but can also be used with other speakers with great success. They are the suggested stands for these speakers to get the maximum audio performance out of the Rebel Reference. They look good and perform at a very high level while being high WAF (wife acceptance factor). So many stands have an industrial look that doesn't fit very well in most living rooms and as such makes this speaker stand out from the crowd. Crafted from quality products and furnished with rubber feet to go on any surface without damage makes them an easy install. The possibility of adding spikes is offered and both rubber feet and spikes can be available on the stands to accommodate your most praised way of coupling the speaker stands to the floor. The standard finish is flat black tubes and black tinted wood that is then finished with at least two natural hard oil coats. This gives a very fashionable and high quality finish that is durable.